1. Saute the sliced shallots in the olive oil for 2-3 minutes until caramelized. Set aside. 3. Add the cauliflower, potato, shallots (and oil from shallots), soy creamer, spices, maple and salt. Do not add the vinegar yet. Blend on medium in a Vitamix or food processor until smooth. 4. Add in the vinegar. You will watch the color intensify to a pinkish tone. Blend on low. Do a taste test and add in more pink salt if needed. 5. 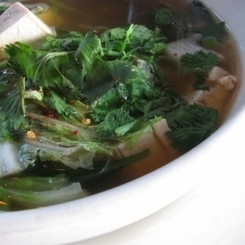 Your soup will be warm enough to serve right away. Or store in fridge and reheat. 1. Set out all your ingredients. 2. Set a burner to medium heat and spray pan with non-stick cooking spray (repeat for each pancake). 3. Combine the 4 dry ingredients (flour, sugar, baking powder -- two Tablespoons, not two Teaspoons as some have suggested, salt) in a bowl. 4. Add the soy milk and vegetable oil to your mixture. 6. Now the pan should be ready for your batter, so spoon one pancakes' worth of the mixture into the pan. 7. Flip [carefully] when you see bubbles in the middle of the pancake, or if the edges are looking stiffened. 8. Repeat until the batter is gone, and try not to eat them all while you're cooking them. 1. Combine all ingredients except the garbanzo bean juice in a food processor. Add the juice a bit at a time until the desired consistency is achieved. 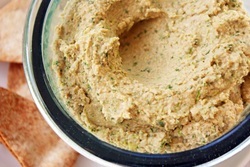 If you've added all the liquid and the hummus is still a bit too solid, add water a teaspoon at a time until the desired consistency is achieved. spoon into a dish, serve and enjoy! 5-10 minutes, stirring ooccasionaly and reducing heat if necessary. Remove from skillet and place in a covered bowl. same skillet with 1/2 teaspoon olive oil and let cook until brown on one side; flip and do the same for the other side. Place on plates and enjoy! - Braggs Liquid Aminos, Salt, and Pepper to taste. 2. Add all remaining ingredients and reduce heat. Allow to simmer as long as desired (the more you simmer the soup the more flavorful it will be!). Serve warm and enjoy! Carve out the top and scoop out the pumpkin seeds with a spoon. Place pieces in pot and cover with water. Bring to a boil. Scoop out the 'flesh' into a food processor. Discard skins. Blend until smooth. 3 COMBINE flours, baking soda, baking powder, cinnamon, nutmeg, ginger, clove and salt in medium bowl. 4 Beat sugar and vegan margarine or butter in large mixer bowl until well blended. 5 Beat in pumpkin, applesauce and vanilla extract until smooth. 6 Gradually beat in flour mixture. 7 Drop by rounded tablespoon onto prepared baking sheets. 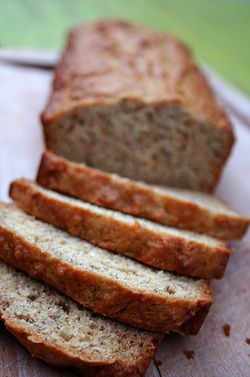 8 BAKE for 15 to 18 minutes or until edges are firm. 10 remove to wire racks to cool completely. 11 Drizzle glaze over cookies. 12 FOR GLAZE: COMBINE 2 cups sifted powdered sugar, 3 tablespoons soymilk, 1 tablespoon melted vegan butter or margarine and 1 teaspoon vanilla extract in small bowl until smooth. I just realized today that months of our gravy recipe being online, we never added the biscuits. These are awesome in a pinch as they are easy to prepare, quick to cook and just all around delicious. Combine and mix dry ingredients. Mix in we ingredients until combined. Be careful not to overmix. Mash the bananas well and combine them with the butter and the sugars to cream. Add the salt, baking powder and baking soda to combine. 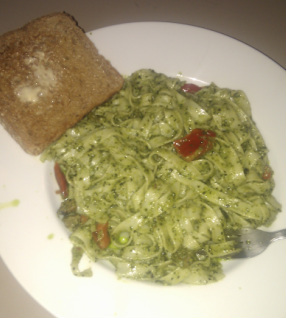 Just to say it simply, vegan pesto is awesome. You can use it for all sorts of things like pasta, sandwhiches and wraps. Plus, nothing beats the smell of fresh basil. It lights up the whole house. I've been making this recipe for years. The nutritional yeast isn't really required, plus there are variants out there that allow you to use different types of nuts, though I've never tried that. I did try once, however, to put it over raw zucchini which was disappointingly not very good. Try it out! Blend garlic and pinenuts together in a food processor, then blend in the basil. Finally add olive oil and nutritional yeast and process until smooth. Season with salt and pepper. When I first went vegan, one of the things I found myself missing was french toast so I set out to make a vegan vesion of it. Since this was the time before the internet was everywhere and accessible from any gadget within arms length, I had to go scouring through recipe books to find something suitable. It seemed every recipe called for tofu. I don't know if you've ever tried this, but I just couldn't stand it. I tried several different versions and couldn't find anything that resembled non-vegan french toast. After a few years of this I was about to give up. Then I bought a book called "The Vegan Sourcebook". Not only is it delicious, but it also opened me up to the world of Nutritional Yeast. I gave the book away to a friend years back, but here is essentially the same recipe. 1. Mix together all ingredients (Minus the bread of course) and let the mix sit for a few minutes, while you heat up a lightly greased skillet . 2. Dip bread slices in mixture, coating both sides, and lay on skillet. Flip the toast when it is lightly browned & brown other side. 3. (Optional) If you'd like, you can also top with your favorite fruits, cover with earth balance and maple syrup or experiment with different toppings. Enjoy! 1. In a large frying pan, heat the oil. 2. Cut tofu into 1/3-inch thick slices (Cut in half again if desired). 6. Place each slice in the frying pan (make sure there is enough oil so that each piece is completely submerged - you want both sides to cook at the same time). 7. Cook for 5-10 minutes or until golden brown. 2. Blend for 1-2 minutes. Serve and enjoy! For cornbread to go with the chili! This stuff comes out pretty sweet so you if you'd like, can reduce the sugar or swap for agave nectar. In a large bowl, combine flour, cornmeal, sugar, salt and baking powder. Stir in egg-sub, soy milk and vegetable oil until well combined. Pour batter into prepared pan. This recipe holds a lot of magic for me, as Billy made it for me on one of our most special and magical dates :) Whenever we cook it I am instantly transported back to a peaceful summer evening where we are eating this delicious chili before heading off to a free play in a nearby park; relaxing in my backyard, taking in the smells and sounds of summer and talking excitedly about the future, sharing good jokes and lots of smiles. *Optional: add 1 tofurkey sausage, 1 cup TVP or any other meat substitute. Feel free to experiment. In a medium to large soup pot, sautee the onion, bell pepper and garlic in the olive oil. Add tomatoes, vegetable broth and chili powder and stir. I've been making this cake and frosting combination for years now and it's a surprise that I've waited this long to share it. I originally found these recipes on www.vegweb.com and modified them to my own liking. I use less sugar than the original recipe for the cake calls for and made a couple other small adjustments. I think anyone who loves vegan sweet treats definitely needs to try this out. A perfect cake for those fence sitters who think delicious vegan goodies can't exist (really though... it's 2011, do people really still believe that vegan food can't be good? Get with the times already!) It comes out very moist and stays moist if you keep it in a cake bin, or an escake pod, or whatever these locking cake cases are called (they are called Snap N Lock Cake Cases apparently). The frosting comes out like fudge, and is especially good when you split the batter between two 9in cake pans so you can layer it. 1. Mix sugar, cornstarch, salt, and cocoa in a medium sauce pan. Whisk in the water. 3. Remove from heat and stir in oil and vanilla. Cool and spread on cooled cake. Enjoy! It''s great in the shower. It's wonderful by the sink. Heck, it's even great for your teeth! So why wouldn't everyone's favorite time-trusted all-purpose body cleanser be just as awesome at scrubbing up your house? We've tried out this nifty little concoction around the VPO headquarters, and we're pleased to say that our favorite scent of Dr. Bronner's is just as refreshing out of the shower as it is in. 1. Fill a 16oz spray bottle with the water. Add the Dr. Bronner's and tea tree oil. 2. Shake well and spray on kitchen, bathroom, and other hard surfaces around the house. Wipe off with a damp cloth. We made a batch of these for the Worldwide Vegan Bakesale and - !!! Holy Toledo these things are good, and we daresay they will make their way into heavy dessert rotation here at the VegPress HQ. With a flavor that's juuust sweet enough, and all the sophistication and decadence of a "classy" dessert, these treats involve a combination of superfoods that will leave you feeling delightfully refreshed, rather than that heavy, weighed down, why-did-i-eat-that feeling associated with heavier, sugary sweets. These are a great idea for summer parties and are DELICIOUS with a glass of wine, champagne, or a Knudsen spritzer served in a fancy glass for all you straight-edgers out there ;). 1. Put blueberries, cocoa powder, lavender, and salt into a blender and puree. stream in 1/4 cup of the water slowly. 2. Add 1/2 of the agave nectar and sample for desired sweetness; if a sweeter taste is desired, add the remaining nectar, or omit if preferred. 3. The consistancy should be moist enough to scrape from the blender and easily roll into form-holding balls; if more moisture is needed, add the remaining water slowly and continue to mix. 4. Put filling in a storage container in the fridge for at least 1 hour. 5. Remove mixture from fridge. Line a small cookie sheet or cake tin with waxed paper and roll mixture into balls the size of 2 teaspoons and place balls on sheet. Place sheet in freezer to set for 5-10 minutes. 6. In a small bowl, pour some cocoa powder for dipping the balls and place next to the stove for easy access. 7. Melt the dark chocolate chips on the stove in a small pot on low heat. Be VERY careful as it is VERY easy to burn chocolate! 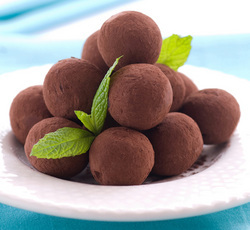 when chocolate is melted, dip balls into chocolate by balancing them on two forks and lowering them into the pot. Place each ball immediately into the small bowl with cocoa powder and roll until thoroughly coated, then place again on the waxed baking sheet. Do this with each ball. 8. Place the sheet back into the fridge until ready to serve, or store the truffles in a sealed container in the fridge for up to 2 weeks. Nothing says "Good Mornin', Sunshine!" better than a heaping plate of tofu scramble! This versatile dish is typically served up as a more delicious version of eggs, and healthier with zero cholesterol (not to mention the awesome fact that it's 100% cruelty-free!). Serve it up with a side of greens and beans, biscuits and gravy, on toast with Daiya cheese or with beans and soyrizo and Frank's Red Hot for a delicious tex-mex flavor. We're posting a bare-bones recipe we like to use as a base that can be used for different variations, but tastes great all on it's own as well. This tasty dish is great for breakfast-in-bed with your special someone or make it in large quantities for a weekend brunch party with your vegan (and non-vegan!) friends! 1. Open package of tofu and drain all water. In a medium mixing bowl and using a fork (and knife if needed) or your clean hands, mash the tofu until it becomes small crumbles. 2. Mix in the oil, soy sauce, garlic, paprika and nutritional yeast; mix until distributed evenly throughout the tofu. 3. Add in the curry powder, one tablespoon at a time, until desired spiciness is achieved; add salt and pepper to taste. This is a staple food of the vegan diet; we here at VegPress like to refer to it as "The Ol' Standby". Delicious, healthy and easy, this dish cooks up in no time, can be enjoyed by itself or served up as a hearty side dish to any meal. Also, there are many different variations that can be made; you can swap the collard greens or broccoli rabe for kale, cannellini beans or black beans instead of red, red onion instead of white, or add some quinoa or couscous to round it out - tasty and filling! 1. In a large skillet (preferrably cast iron or stainless steel), heat the olive oil, onions, and garlic on medium high heat until oil starts to sizzle. Add kidney beans and cook 2-3 minutes, stirring occasionally. 2. Add kale, sesame seeds, lemon juice, pepper and salt, continuing to stir occasionally, and cook another 5 minutes, until kale becomes a bright, vibrant green and everything is well-coated in the oil. Remove from heat and serve immediately - enjoy! Spring is here! And what better way to celebrate than with this light, colorful, and SUPER yummy dish! This is a very simple go-to recipe in the VegPress kitchen, and is delicious served on top of burritos, as a side dish to tofu scramble or over savory baked tofu, as an exotic companion to veggie fish ham or may wah chicken, or next to its classic compadre, the tortilla chip! 1. Using a sharp kitchen knife, slice the fruit off of the mango on each of the four sides, avoiding the hard seed in the center. Take the four slices and cut 1/2 inch scores in it across the fleshy side, both horizontally and vertically, making 1/2 inch cubes. Push up on the skin side so that the flesh of the fruit sticks up like a porcupine. Remove the fruit either by hand or with the knife into a small mixing bowl. 2. 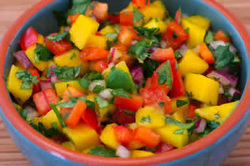 Chop the onion, tomato, and cilantro (cut cilantro to taste) and toss in the mixing bowl with mango. 3. Sprinkle lime juice over the salsa and toss well. Either serve immediately or refridgerate - OLE! After trying for years to find even a decent vegan gravy recipe I finally found one. I found a variation of this through a web search and fine-tuned it to something I've been quite happy with. 1. Measure the vegetable oil into a small saucepan. Cook the garlic and onion in it for about two minutes on medium or medium-low heat, until the onion is a bit tender and translucent. 2. Add the flour, yeast, and braggs to make a paste. Add the water gradually, stirring constantly. Bring the gravy to a boil on medium to medium-high heat, stirring constantly -- the gravy has to boil for it to thicken. Add pepper. Stir in the sliced mushrooms, if desired. Add salt, if desired. 3. If the gravy is too thin for your taste, add one or two tablespoons of flour or small amounts of cornstarch to thicken it and add home-made-looking lumps. Use a wire whisk to eliminate lumps. The original recipe states that refrigeration works well but not recommended to freeze, though I've freezed and thawed the gravy on several occasions and it's come out just fine. Just throw it back into a pot, cook on medium heat, stirring constantly until thawed and add water to reconstitute. As shown, recipe makes roughly a quart. Recipe can be halved. When preparing this recipe and any other food you enjoy, please use organically-grown vegetables, fruits, grains, and flavorings. We whipped up a batch of these yummy cookies earlier this week in the VegPress kitchen during a midnight cookie baking party - and of COURSE we couldn't wait until morning to try one (or five, haha whoops!). These are easy to make and even easier to polish off in a single sitting if you're baking with friends, and are DELICIOUS with a glass of your favorite non-dairy milk (we recommend vanilla hemp milk or vanilla coconut milk - compliments the chocolatey flavor quite nicely). 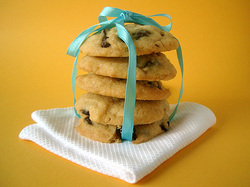 We got a yield of 28 cookies out of this recipe, so you'll have plenty for yourself and plenty to share with others! 2. Mix the dry ingredients (flour, baking powder, baking soda, salt, sugar, cocoa powder) in a medium mixing bowl and set aside. 3. Mix the wet ingredients (agave nectar, molasses, and canola oil) in a medium mixing bowl. Stir in chocolate chips. 4. Pour wet ingredients into the dry and mix until evenly blended. There should be no "white lumps". 5. Using your hands, form dough into balls and place on ungreased cookie sheets. Leave some spacing as cookies will flatten and expand in the oven. 6. Cook for 10 - 12 minutes, then take out and let cool. These cookies come out delicious! Make sure your ingredients are at room temperature before use. No big deal if they aren't, but the results are much better if they are! 1. Preheat oven to 350 degrees F. In a large bowl, mix together flour, baking powder, salt, and cinnamon. Stir in the chocolate chips. Shape a well in the center and set aside. 2. In a medium mixing bowl, add together sugar and oil and mix well. Add the vanilla followed by the water and mix well. Add the wet ingredients to the well in the dry ingredients. Mix it well but be sure not to overdo it. Add more chips if necessary - depending upon how much chocolate you like :). 3. Spoon onto ungreased cookie sheets and bake for 8-12 minutes (these bake up quick!). 5. Get the soy (or almond or hemp) milk ready and enjoy when ready!